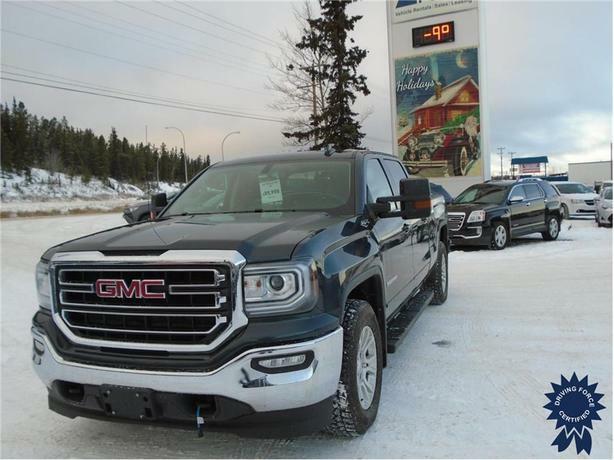 This 2017 GMC Sierra 1500 SLE Crew Cab 5 Passenger 4X4 6.5-Foot Medium Box Truck comes with a 153-inch wheelbase, 6-speed automatic electronically controlled transmission, heavy-duty locking rear differential, 3.73 rear axle ratio, 18-inch bright machined aluminum wheels, front cloth bucket seats with heated cushions and seatbacks, Max Trailer Package, engine block heater, trailering equipment, integrated trailer brake controller, 150-amp alternator, capless fuel fill, Bluetooth for phone, backup camera, remote engine starter system, WiFi hotspot, 6-inch rectangular black tubular assist steps, front and rear moulded splash guards, outside heated power-adjustable vertical trailering mirrors, spray-in bedliner, wireless charging, all-weather floor mats, 8-inch Diagonal Color Touch Screen with IntelliLink, AM/FM/SiriusXM satellite capable radio, and GWVR rating of 7,600 lbs (3,447 kgs). The 5.3-litre EcoTec3 V8 gas engine with Active Fuel Management provides 355 horsepower at 5,600 RPM and 383 lb-ft of torque at 4,100 RPM. Touch base with us to discuss purchasing or financing options that are right for you and experience the difference you will only find at DRIVING FORCE Vehicle Rentals, Sales and Leasing.